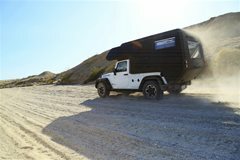 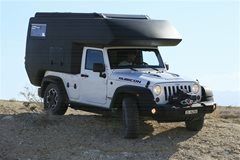 The Jeep® ActionCamper© has been developed for overlanding and expeditions with two passengers. 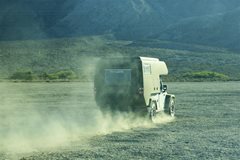 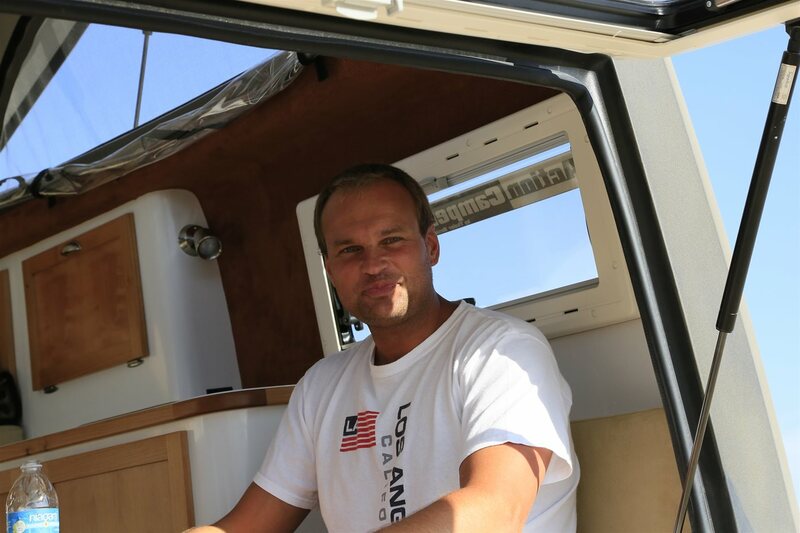 The interior is incredibly spacious and fitted with all of the amenities to have a comfortable and unforgettable expedition experience to remote areas. 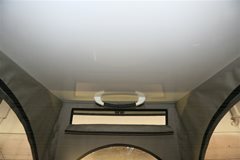 The pop-up roof offers in the kitchen area a clearance of 203cm (6'8"). 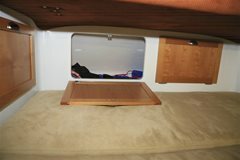 All Dometic S4 windows come with bug screens and blinds. 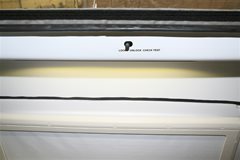 The honeycomb insulated roof allows to install four 100W solar panels (400W total). 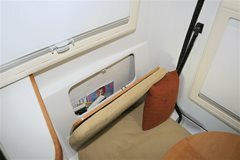 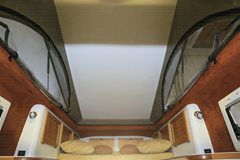 The roof tent has three vinyl windows; the side windows open and offer bug screens; all three come with detachable privacy covers. 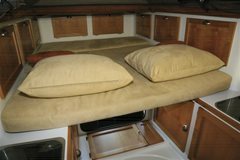 The mattresses, seats, backrests, pillows and part of the walls are covered with stylish colored, cleanable Alcantara. 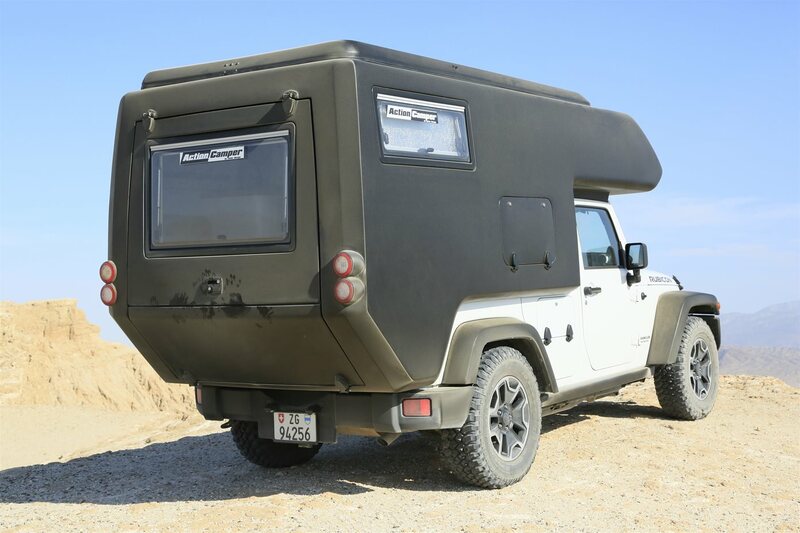 The following description refers to the first customer vehicle, colors and materials may vary later in production! 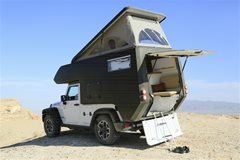 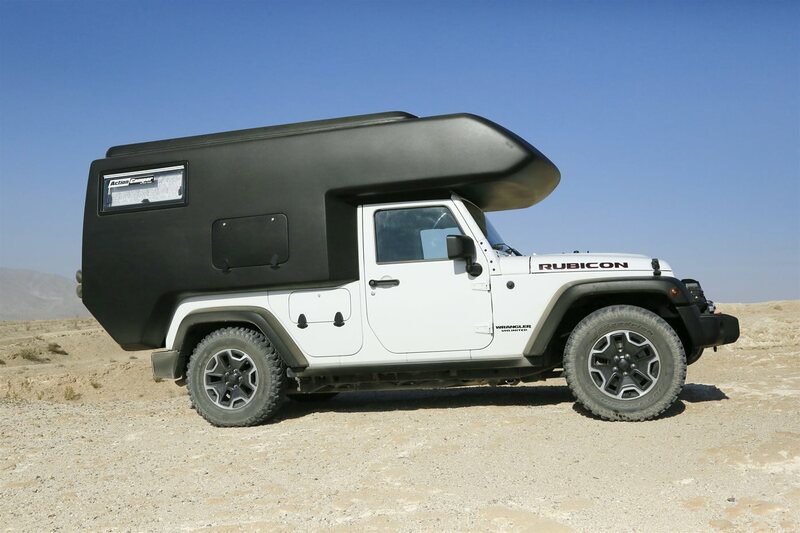 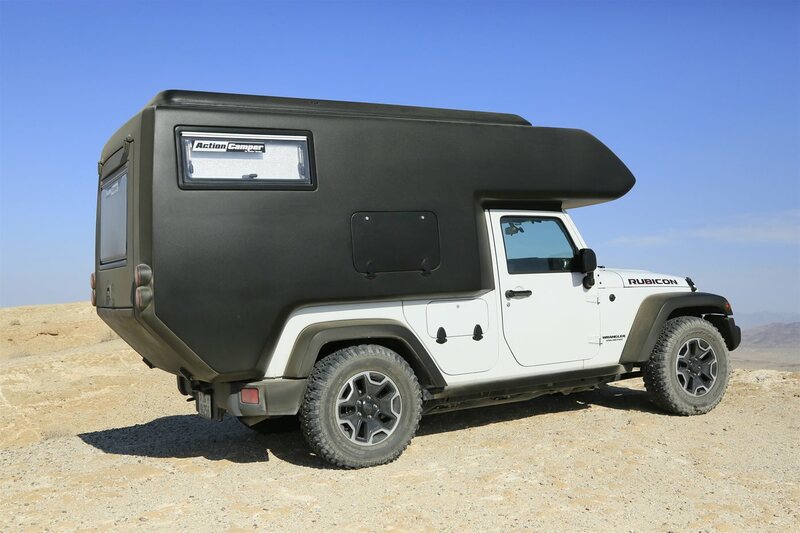 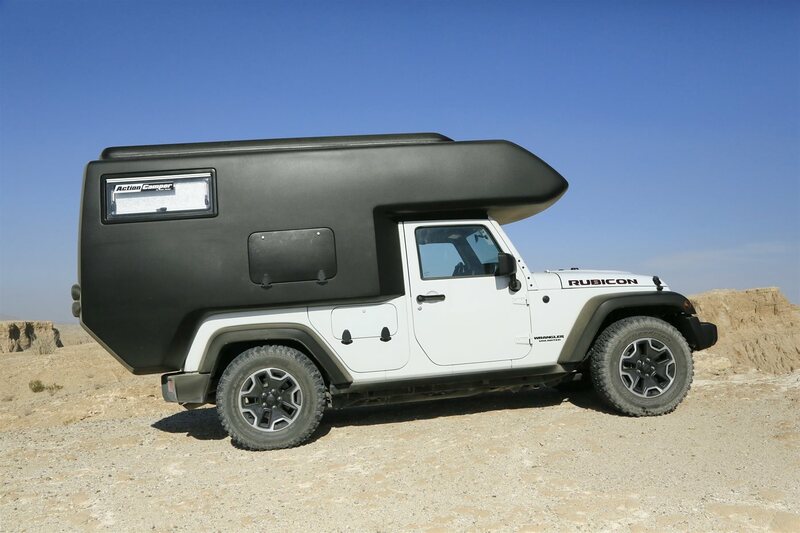 The Jeep® ActionCamper© is made of fiberglass. The interior is glued to the body as a structural reinforcement to achieve an innovative lightweight design. 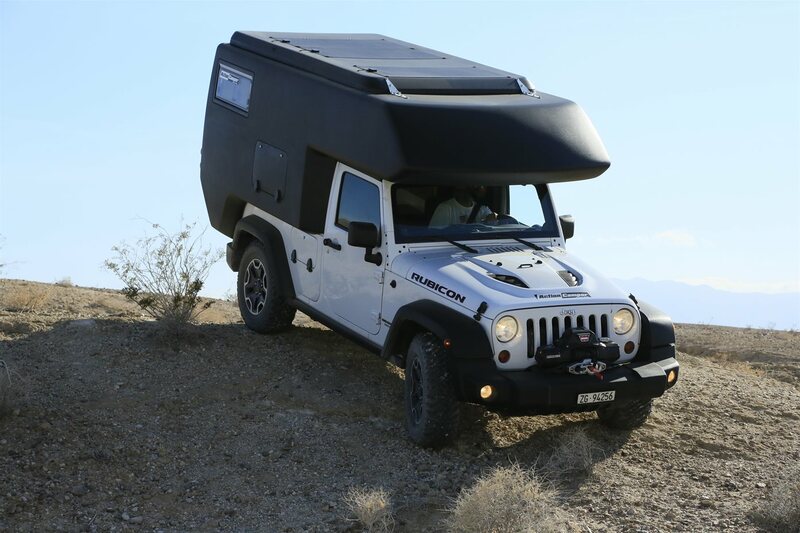 Because the original hardtop, tailgate, rear seats, seatbelts, and the rear roll cage are removed, the weight increase is less than expected. All components are designed in 3D CAD to make even the smallest areas useful. There are even hidden compartments next to the roll-bar. 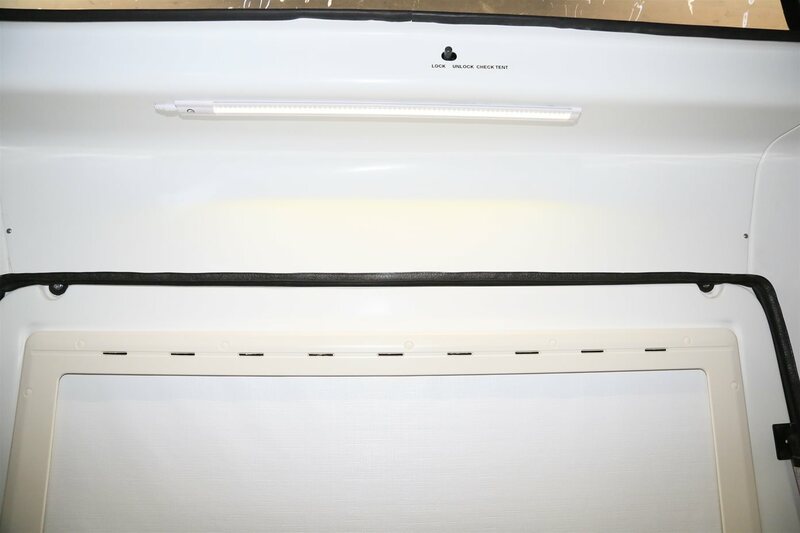 All taillights are Jokon 730 LED fail proof, power saving LED lights. 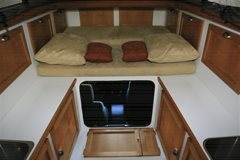 The upper tailgate has a standard RV lock assembly with burglar save dead bolt; inside is the opener, lock and grab-handle plate; the lower tailgate unlocks via a center strap; a custom made aluminum ladder is part of the delivery; a grab handle will help to get in and out of the camper safely. 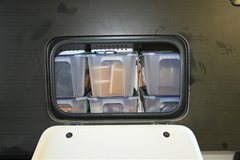 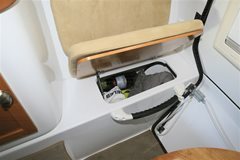 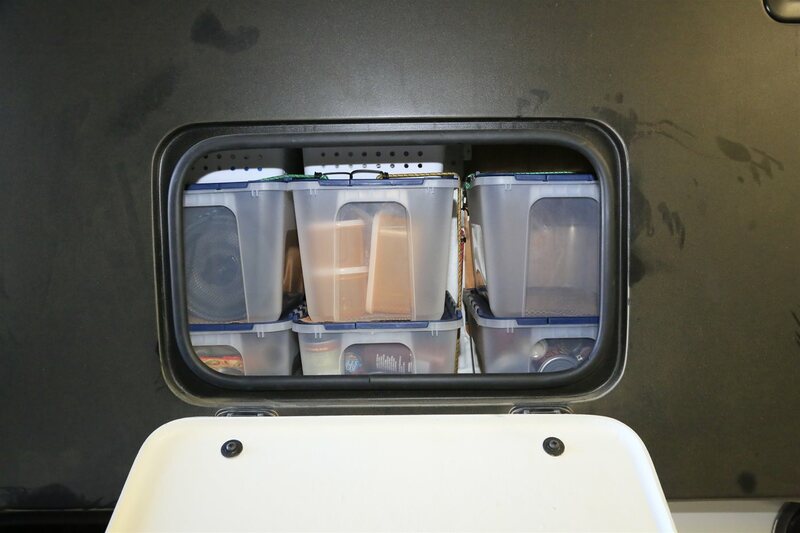 The included fiberglass half-door inserts for the Jeep Unlimited are very lightweight, use automotive seals and bolt on easily (white gel coat, ready to paint); they are fitted with lockable doors to access the large storage spaces behind the seats and the half-doors; they are held open in a horizontal position to serve as trays. 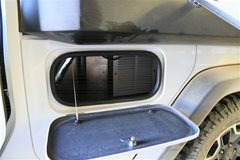 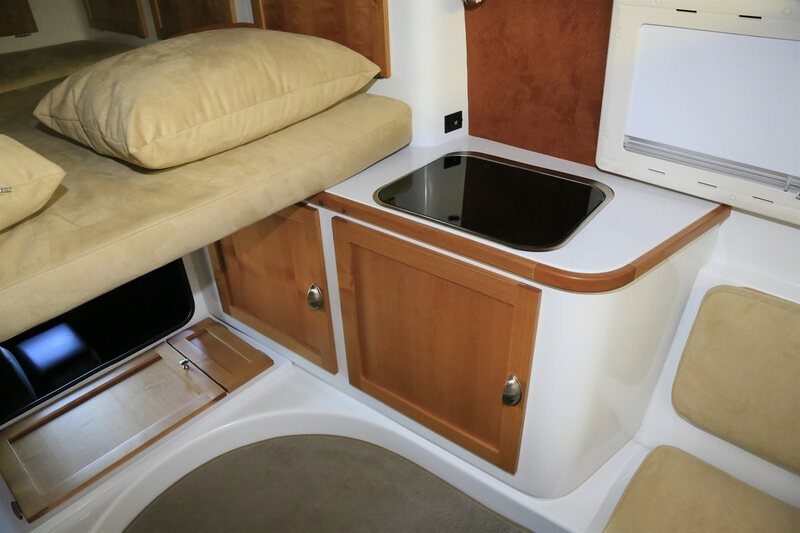 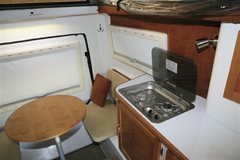 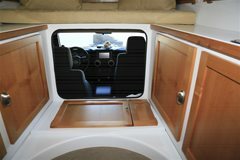 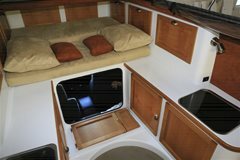 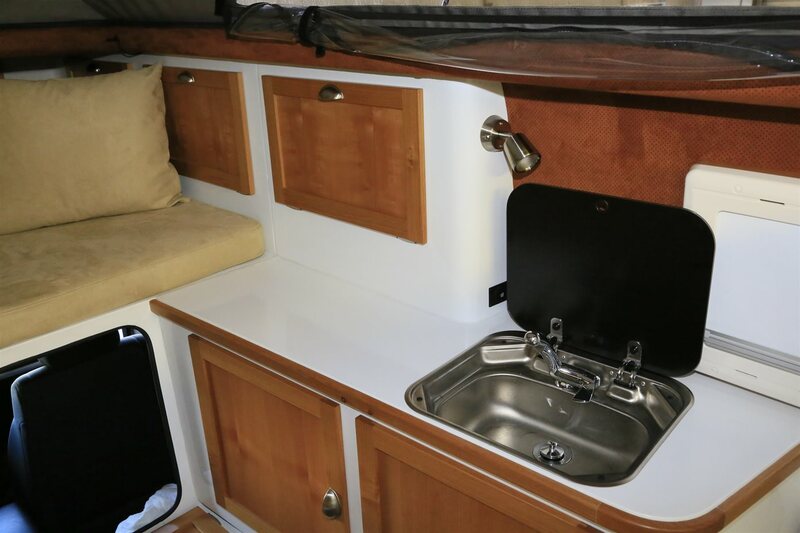 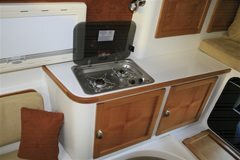 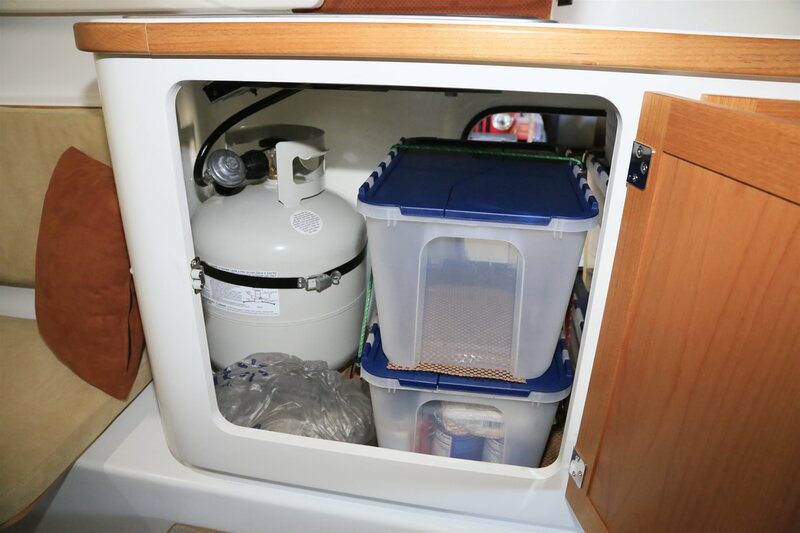 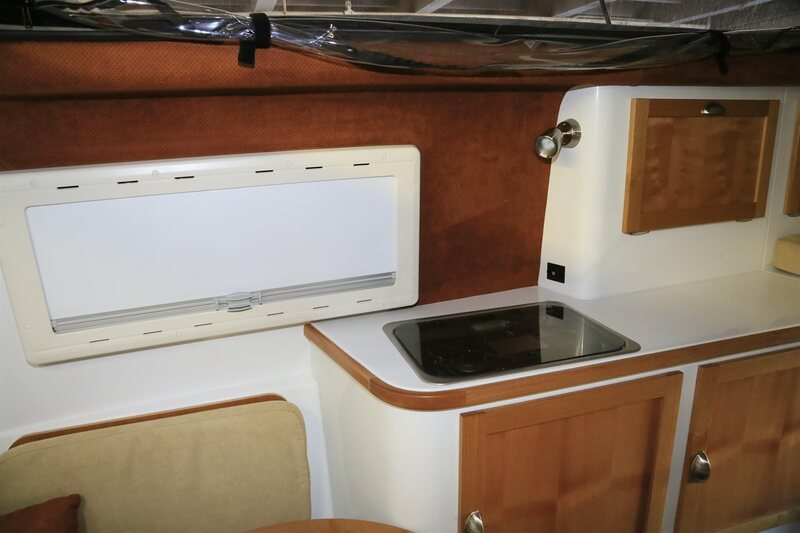 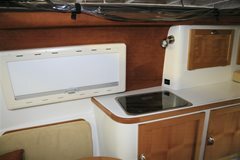 A larger version of the same type of lockable doors provide access to the kitchen cabinets from the outside, perform maintenance on the stove and sink, or allow other installations from outside of the camper; all four doors are keyed alike (camper and half-doors). 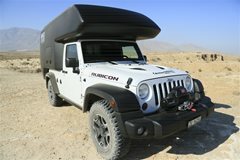 Optionally the ActionCamper may be taken off the Jeep *01. 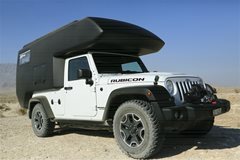 An optional waterproof, lockable cover closes the pass-through *02 while the camper is off the Jeep. 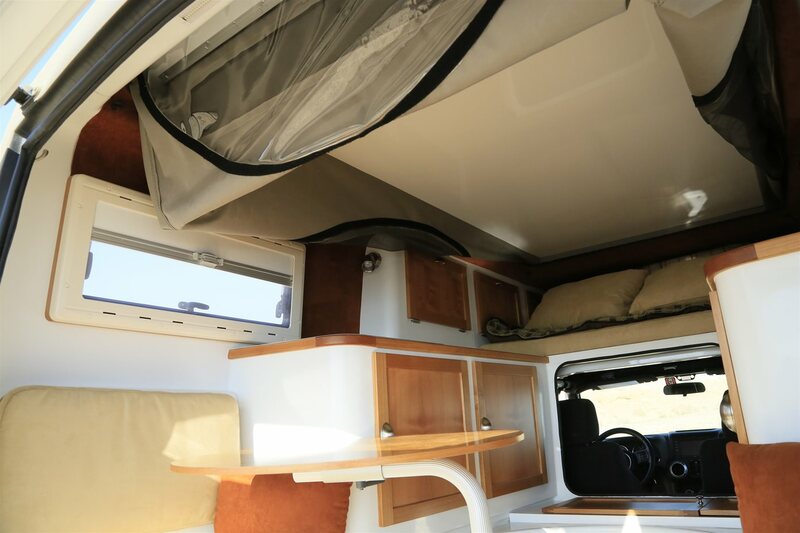 The rear and side double-walled windows (Dometic S4) have roller bug screens and reflective thermo roller blinds; they offer three opening positions plus a lockable ventilation position; the honeycomb insulated roof allows to install four 100W solar panels (400W total) *03. 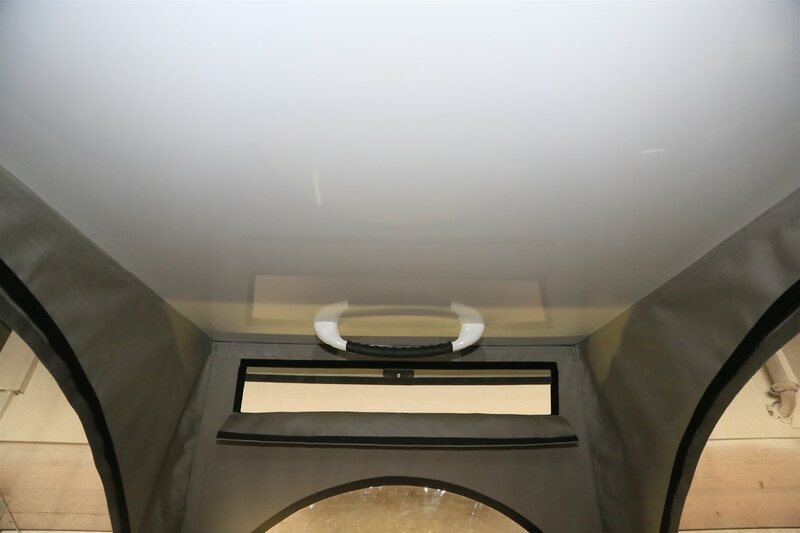 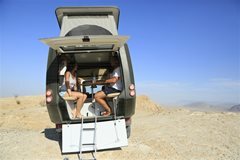 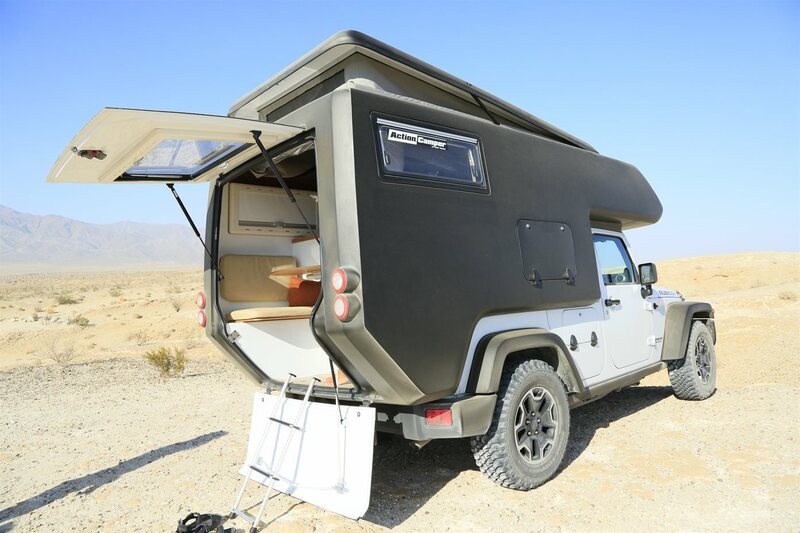 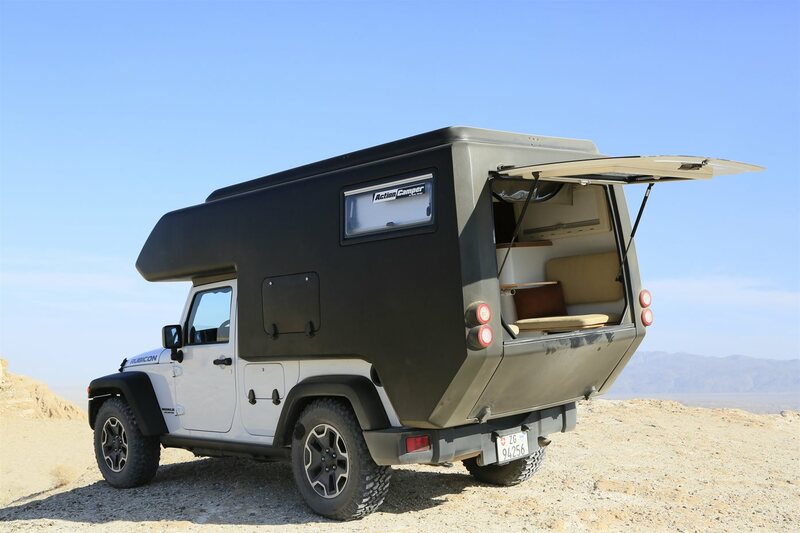 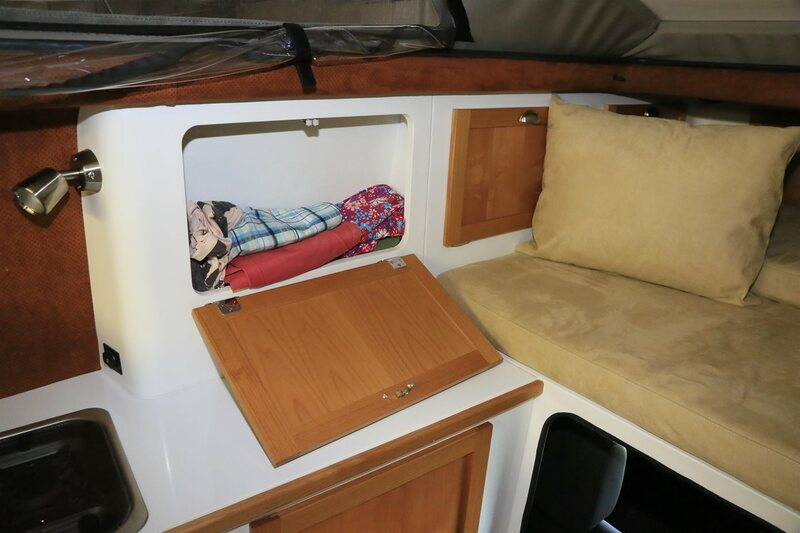 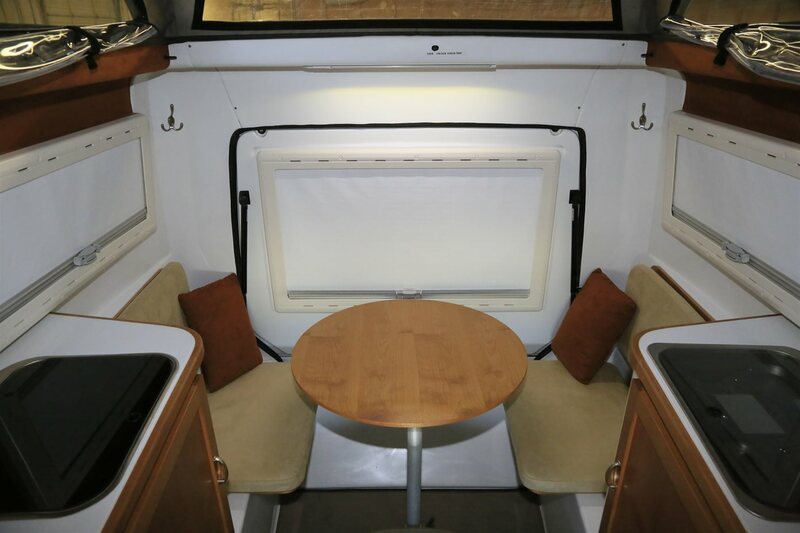 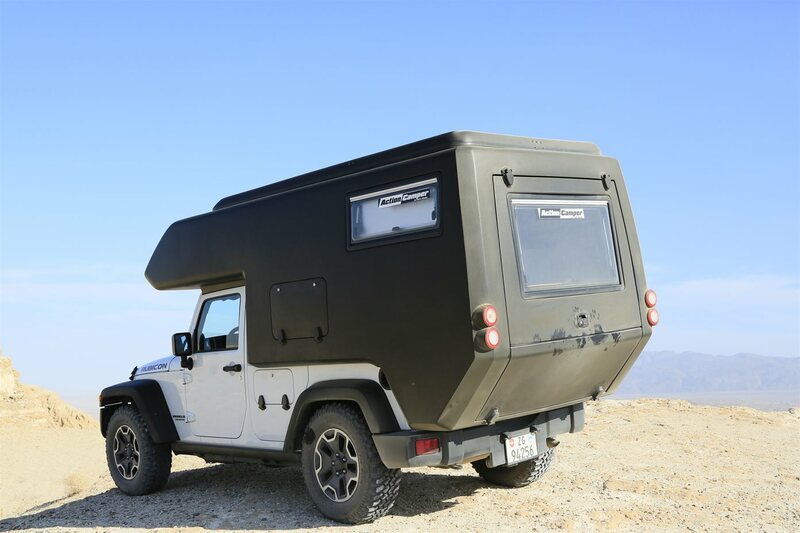 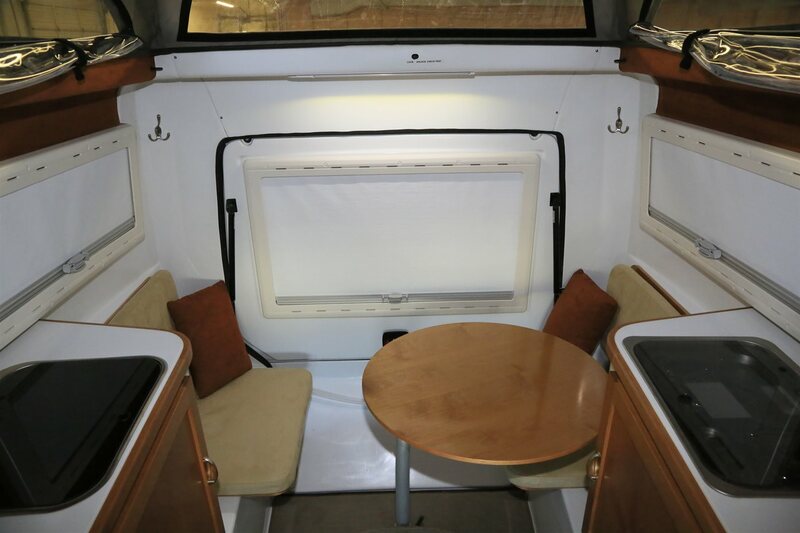 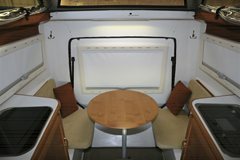 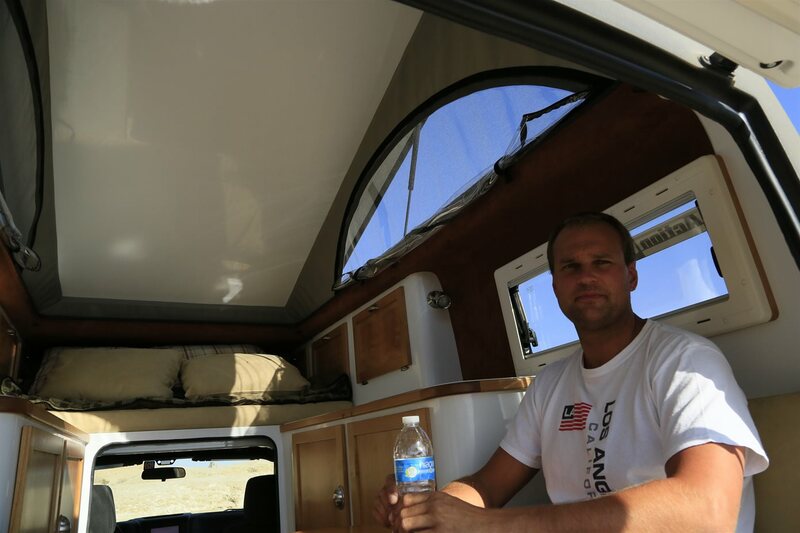 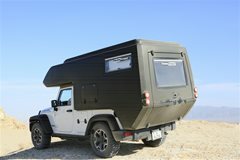 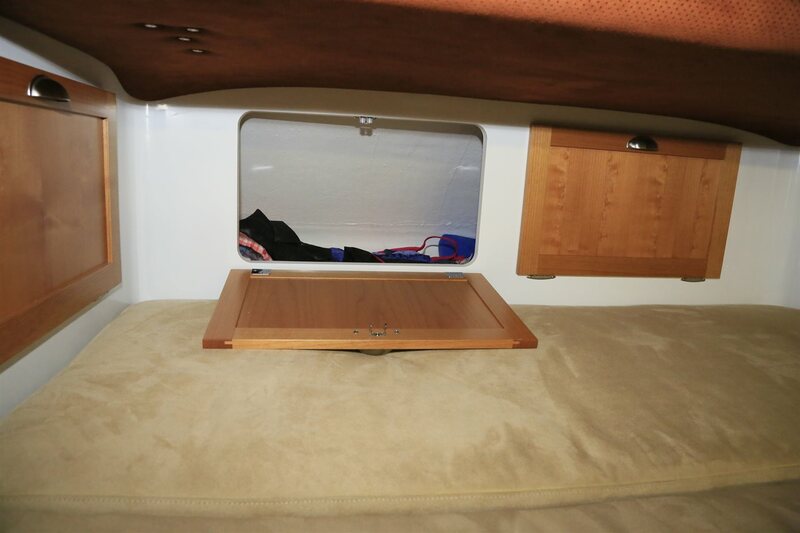 The roof tent has three vinyl windows; the side windows open and offer bug screens; all three come with detachable privacy covers; in the rear top is a wide canvas opening with bug screen for ventilation. We'll offer an optional Velcro mounted thermo insulation *04 for the inside of the canvas area. 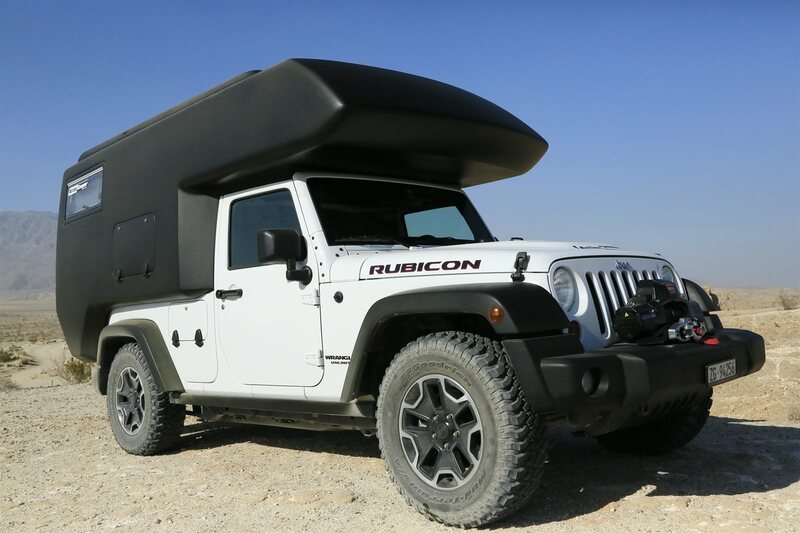 There is a large grab-handle to pull the roof down; the canvas folds down naturally; outside under the roof overhang is an automotive lock / striker assembly with a remote lock / unlock lever inside above the tailgate. The queen-size bed measures 200x150cm (79"x59") and can be fitted with conventional bed sheets; both mattresses and the large pillows come with detachable Alcantara covers (washable, cleanable, anti-mildew, imitation suede); to sleep, simply pull the rear mattress back; the integrated reinforcement panel (glued to the mattress) spans across the countertops; the rest of the countertops serve as bedside tables; on both sides are adjustable, beautiful LED spotlight; the stove and sink may be used with caution while the bed ready to sleep; in the front are two large cabinets, right and left are three smaller cabinets per side; all with big fold-down cabinet doors; the lower cabinets right and left have two large cabinet doors per side; the refrigerator door on the front bottom opens to the left, the little storage door opens to the right; all cabinet door frames are made of alder hardwood, the panels are made of premium alder plywood; every piece of wood is carefully selected to have very similar appearances. 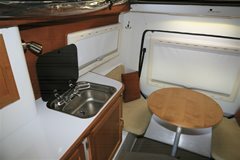 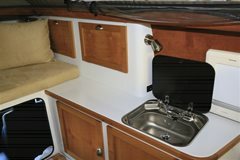 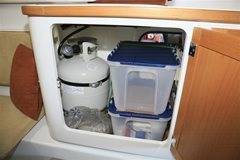 On the left countertop is a 2-burner stove with integrated knobs and starter button (Dometic); the propane tank is stored under the countertop and can be reached and taken out from outside; on the right countertop is the sink (Dometic), with a fold-down faucet; both appliances come with tinted, fold down glass lids; in the right cabinet is the chemical toilet (Dometic) with 8.7 liters (2.3 gallons) water tank and 18.9 liters (5 gallons) holding tank. 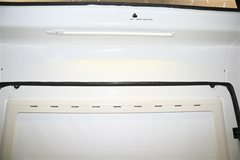 The 40 liter (42 quart) top-loading refrigerator (Dometic / WAECO Coolmatic CB-40) is located below the front pass-through and comes with a removable, vegetable basket; the lid can be opened from the front seats. On the kitchen floor is the removable tire cover with space for a 35"x12.5" tire; the tire can easily be moved out through the rear; under the carpet of the tire cover center is a round panel to access the room within the rim. Under the fold up seats are large compartments; behind the fold down backrests are smaller compartments; the nicely rounded seats and backrest cushions are detachable, Velcro mounted to the premium alder plywood panels with alder edging; these cushions and the little extra pillows come with detachable Alcantara covers (washable, cleanable, anti-mildew, imitation suede); the premium alder plywood table may be rotated to both sides to access the front area. 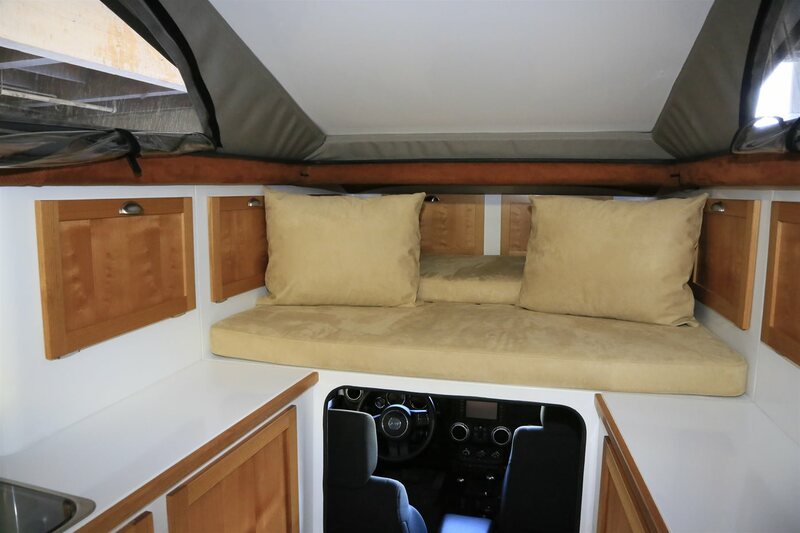 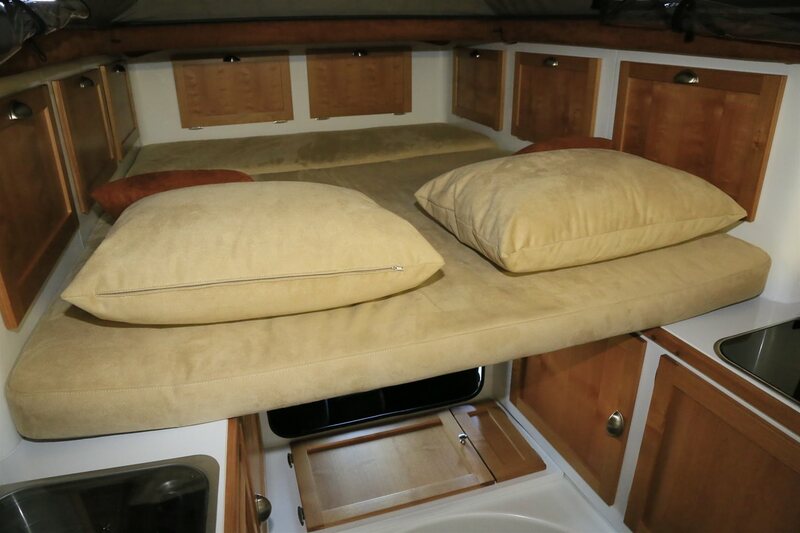 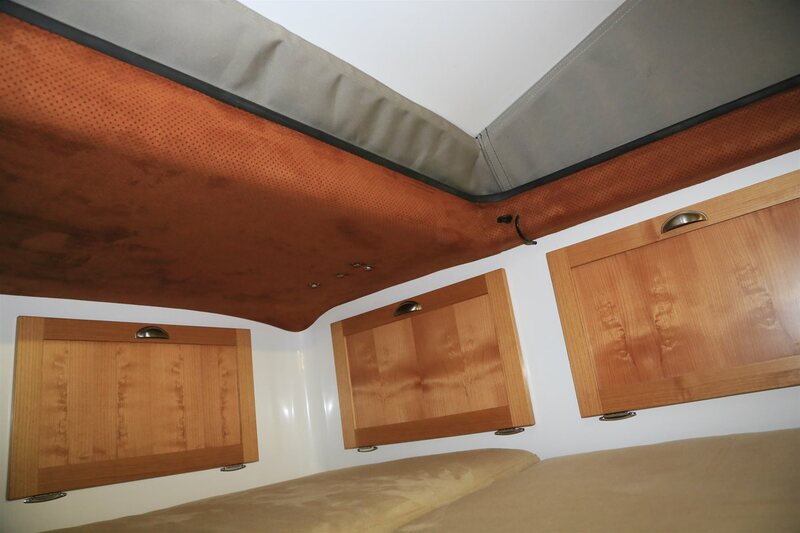 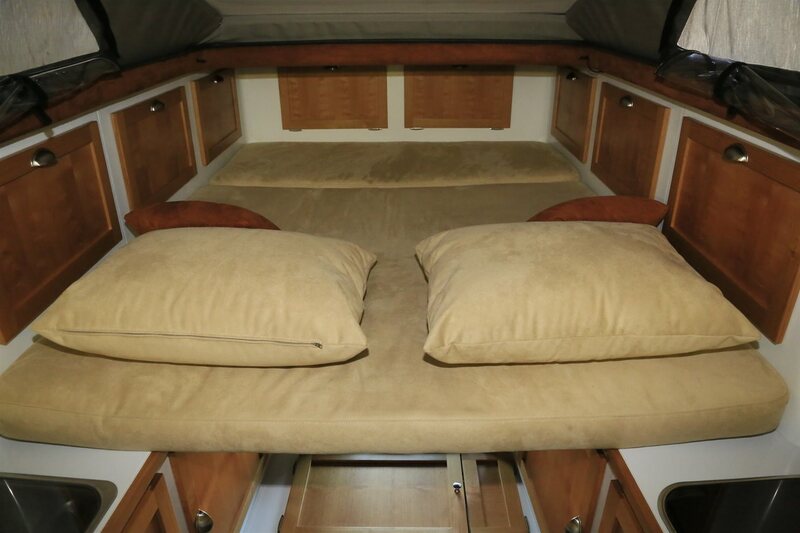 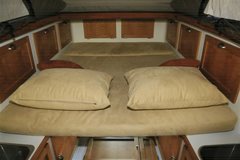 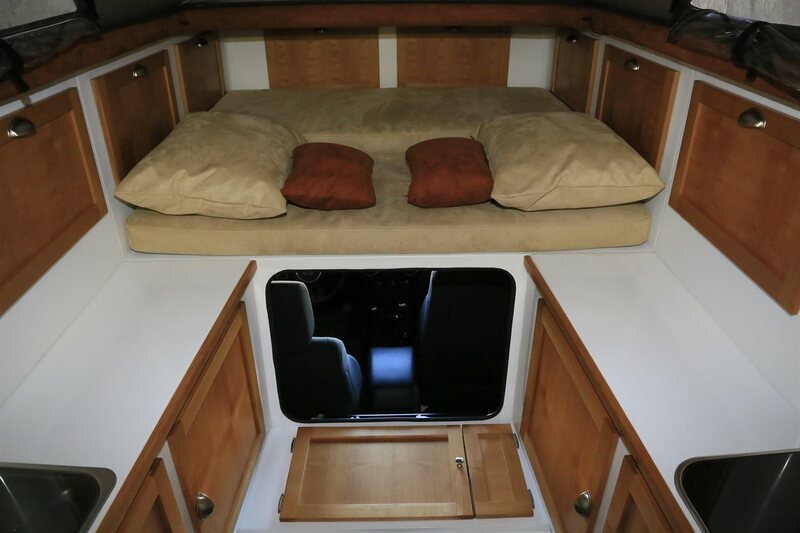 Parts of the sidewalls and the front overhead areas (above the bed) are covered with a special automotive insulating material and upholstered with breathable Alcantara (cleanable, anti-mildew, imitation suede with tiny holes). 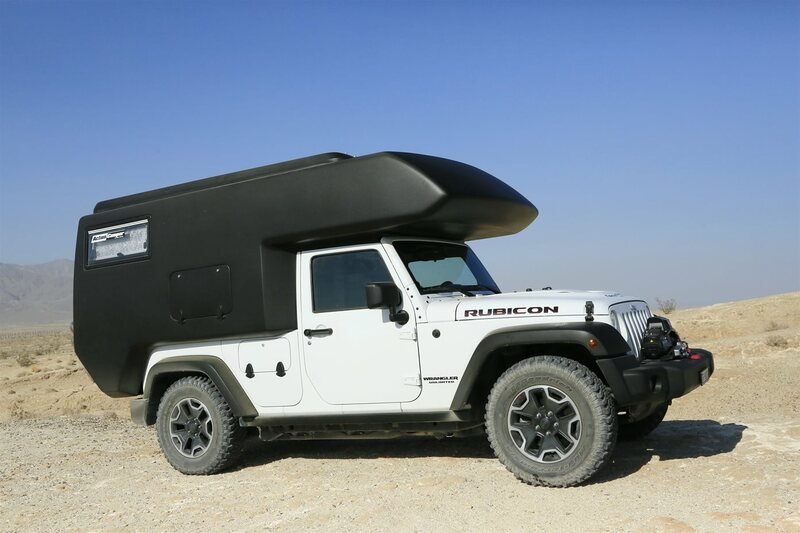 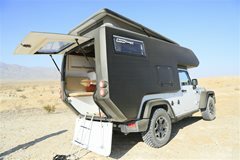 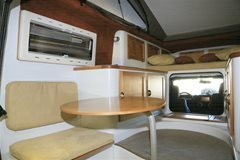 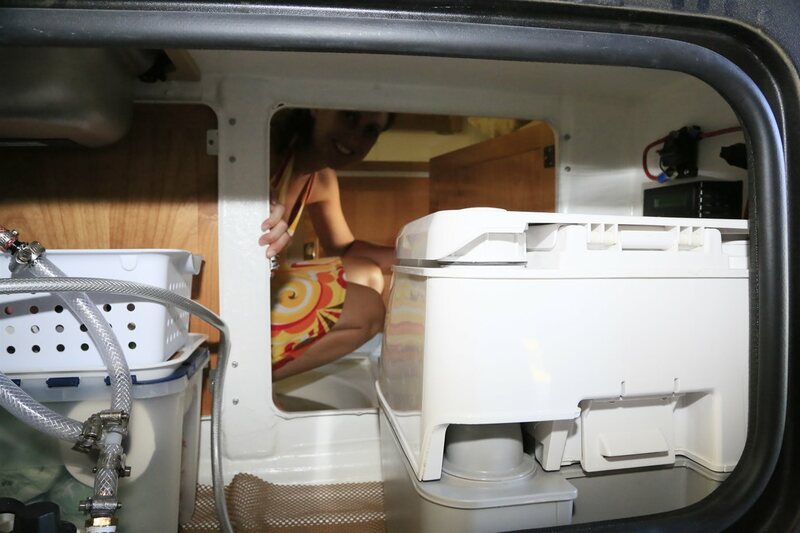 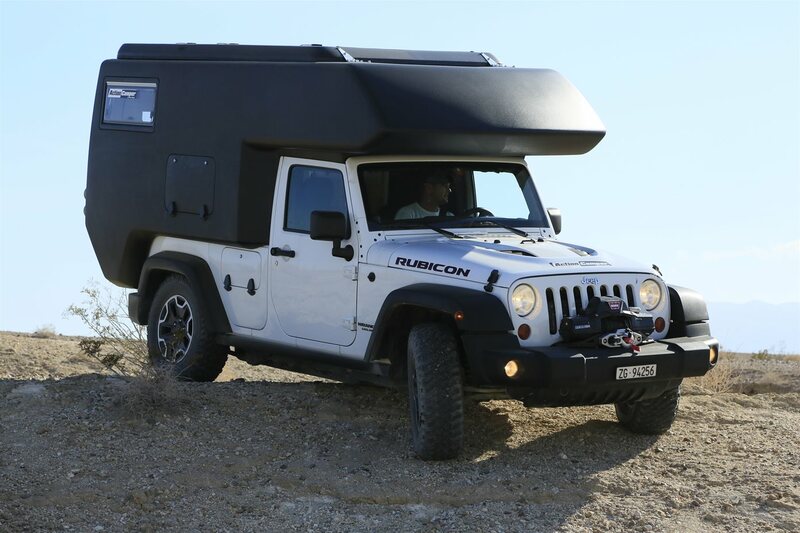 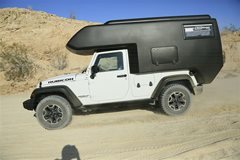 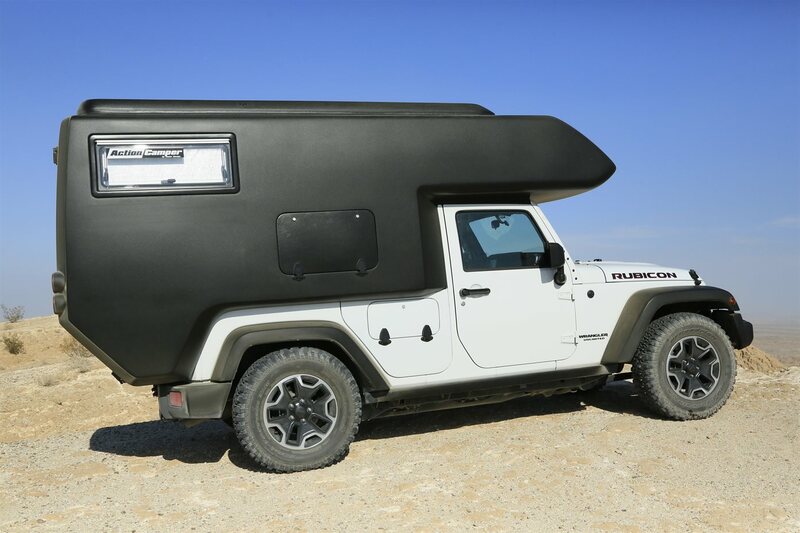 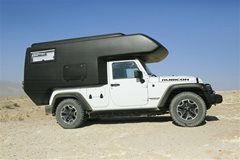 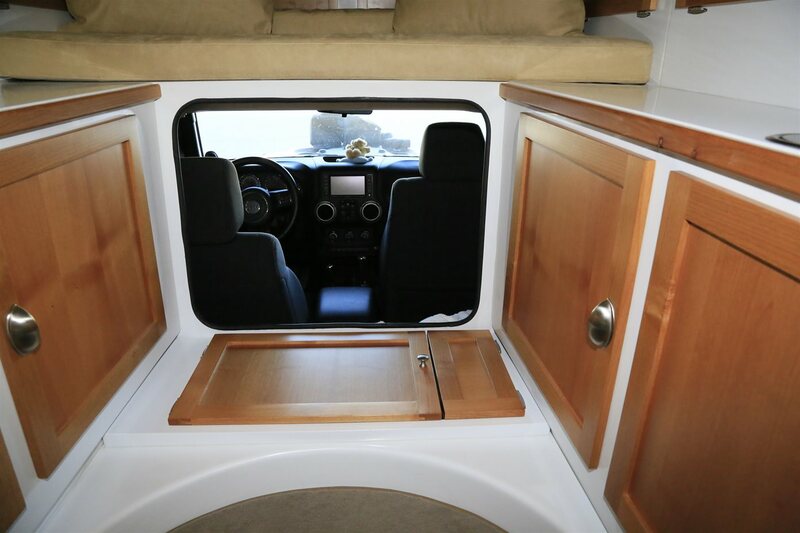 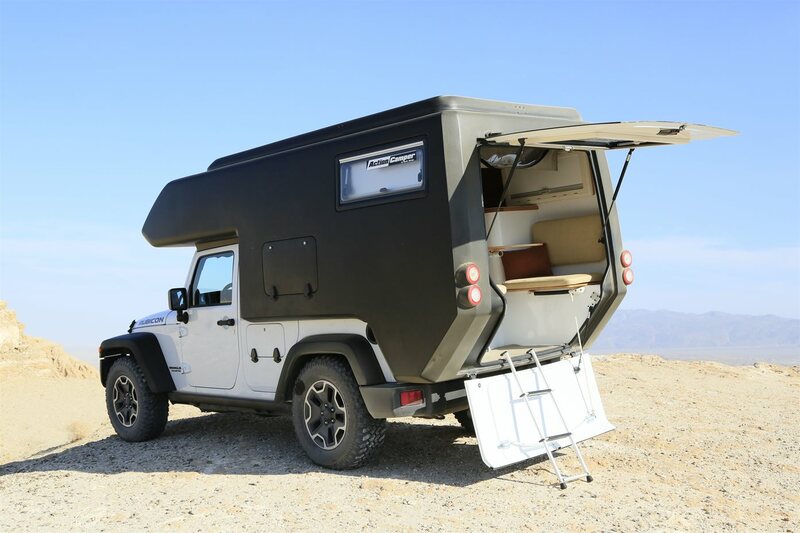 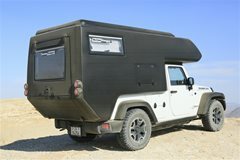 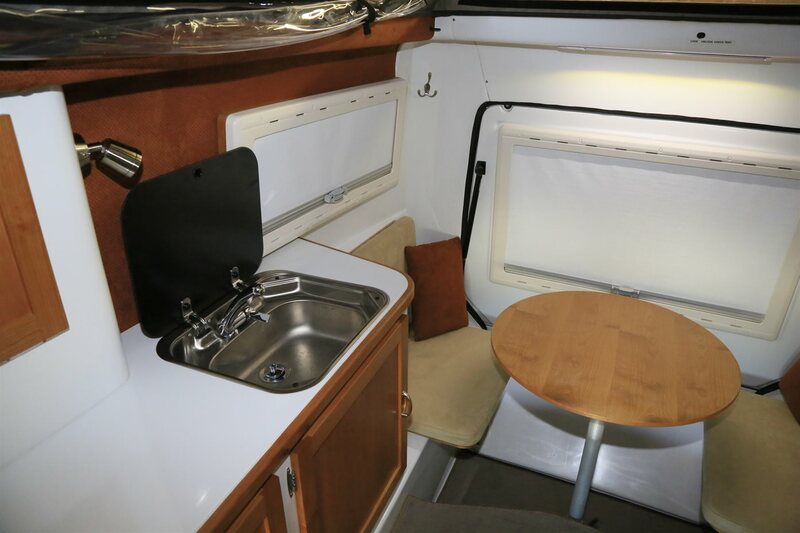 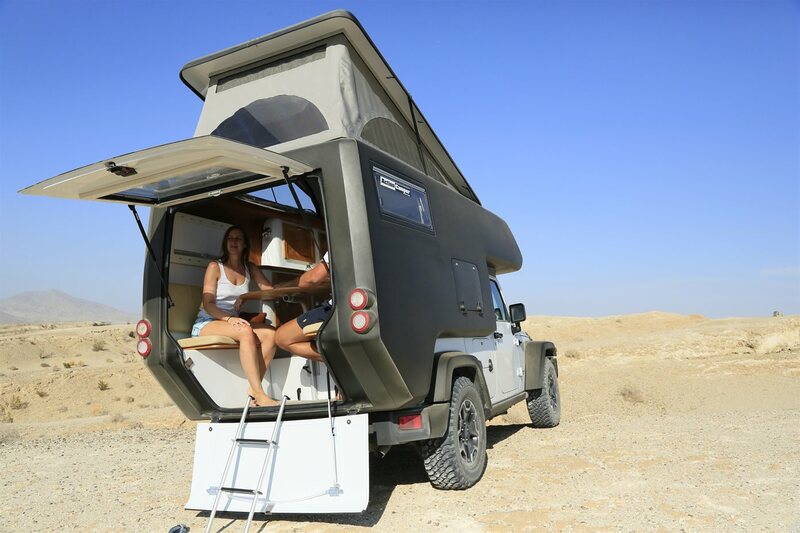 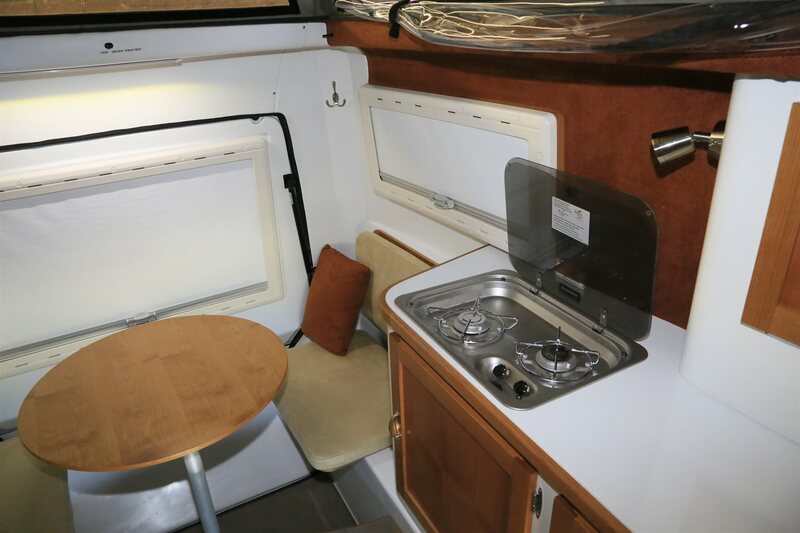 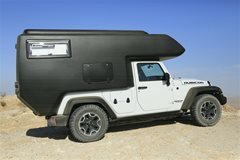 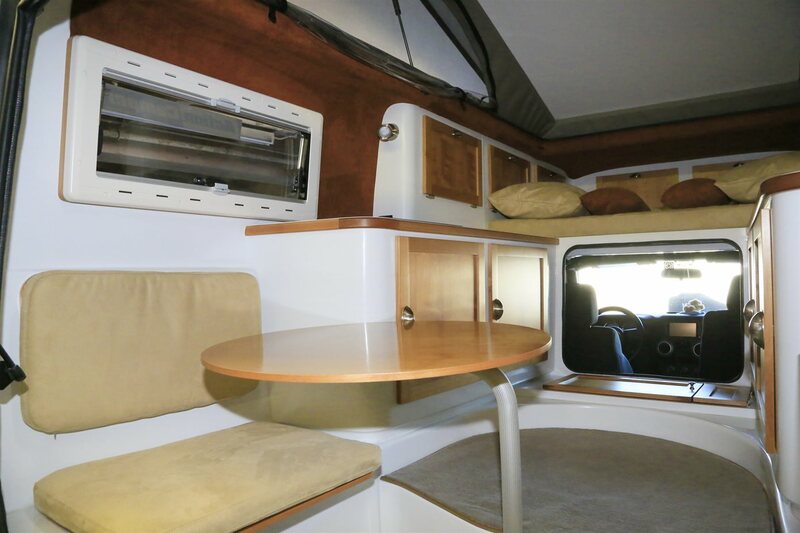 The camper comes with a 19 liters (5 gallons) grey water tank with external drain plug; a 30.3 liters (8 gallons) fresh water tank with automatic water pump; a cable harness with a 6-pole connector at the upper B-pillar on the passenger side to tap into the Jeep taillight wires; a 6-pole connector receiver on the camper with all the wiring to the taillights; a cable harness to connect to the Jeep battery plus and a ground cable to connect to the roll-bar; all the wiring to the LED cabinet lights, 12V plugs, LED dining light bar, the cooktop igniter and the refrigerator. Optional we'll offer dual battery systems for the Jeep, a cable harness to connect a camper battery to the Jeep battery, solar systems, inverters, water filtration, 2nd water tank, spare diesel tank, entertainment systems and navigation systems. 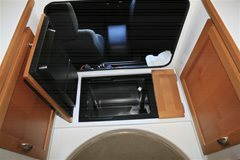 Customers are very welcome to come up with their own wish list, but we only install parts and systems we believe in!! 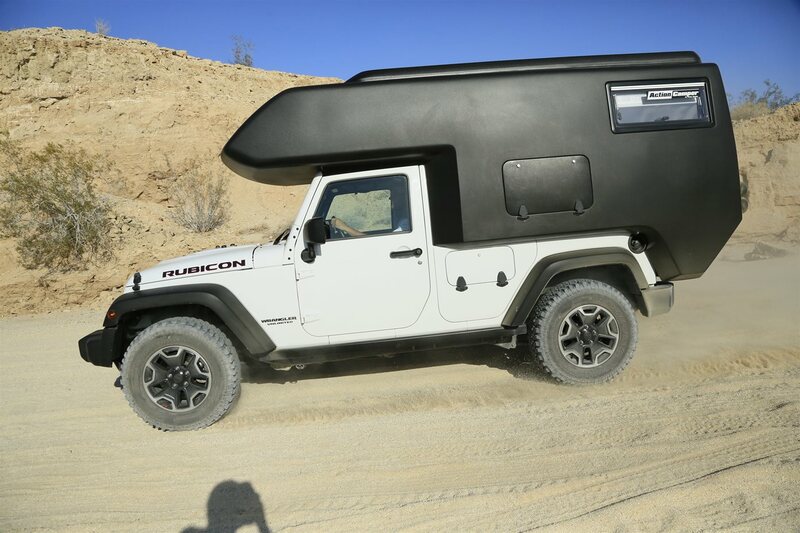 All parts are strictly bolt-on; cutting off of the roll cage, installing the roll cage adapters, the electric harness and the propane tank should be done by our partners or a Jeep dealership!! 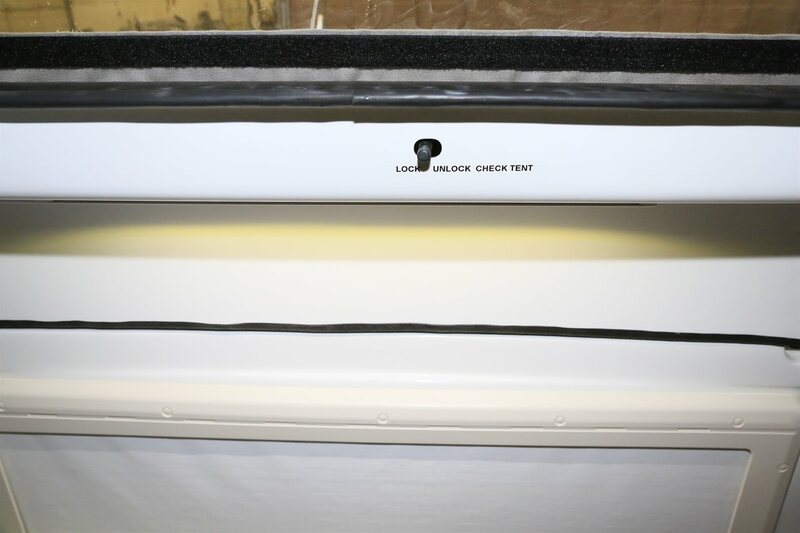 MSRP* Manufacturer Suggested Retail Price; worldwide sold to the customer direct only; not included: installation, options, shipping, taxes, duty, etc..